Thank you Mike for your introduction. I am pleased to be here today on the occasion of the launch of this latest generation of transmission electron microscope as well as the opening of the new and improved George Rogers facility at the University of Adelaide. Thank you for the opportunity to recognise the Australian Microscopy & Microanalysis Research Facility (AMMRF) and the important contribution that the University of Adelaide makes to national capability in advanced microscopy and microanalysis. 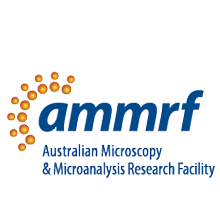 The AMMRF is a collaboration of university based microscopy core facilities just like the George Rogers Laboratory who are working together and providing national resources for Australian and international researchers. Formed under the Commonwealth Governments National Collaborative Research Infrastructure Strategy (NCRIS), our facility meets the needs of researchers for advanced microscopy & microanalysis capability across wide sensitivity and resolution domains. Within the same national facility we support researchers to explore structure-property relationships in physical and biological systems across several orders of magnitude. From the atom to the animal or from the atom to the materials structures that are critical to our life today. Therefore microscopy is essential for discovery and innovation in fields from healthcare and agriculture to engineering and resources and Angus just now provided a snapshot of what can be done. Given the enabling role that microscopy and microanalysis plays in research it is not surprising that facilities like the George Rogers laboratory are a core part of university research infrastructure. The open access, user-focused operation supports hundreds of researchers here in Adelaide per year and collectively around the nation more than 3,000. Angus remarked how the high-resolution SEM/focused ion beam platform opened up new domains of research for the university and the nation when it was launched in 2007. I believe the launch of the aberration corrected Titan here today will have the same effect. High-resolution TEM is a significant capability for our AMMRF partners enabling nanoscale analysis of atomic structure and chemistry of materials. AMMRF laboratories are continuing to meet the demands for researchers as they probe the parameter space I referred to before by investing in latest generation technology. 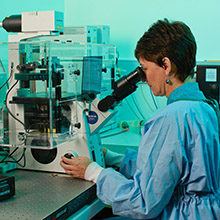 Most recently this includes latest generation of analytical TEM platforms and high-resolution SEM imaging capability, super-resolution platforms for the life sciences, X-ray imaging and microanalysis platforms and now the Titan in Adelaide which is the first aberration corrected TEM platform in an AMMRF laboratory. 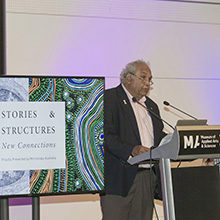 This is a significant first step for the AMMRF and the importance of the technique in helping our users confidently unlock structure-function relationships at nanoscale means what we can offer in this technique to Australian researchers will need to grow. Further investment in the technology is planned by our nodes and the leadership shown here by the University of Adelaide and the experience obtained will be a foundation to AMMRF capability going forward. 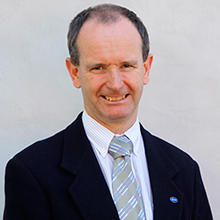 Prof Bebbington you can have complete confidence that this instrument will be successful, it will be highly utilized and will enable world-class research outcomes for Adelaide University. Locating such a platform within a core facility is the right move. It will be supported by dedicated and expert staff who will keep the instrument operating at it at world-class performance and help researchers use it. The multidisciplinary environment of the facility will mean that the fields of research that the instrument is applied to will be broad. Finally the national network that the Titan is now a part of will ensure that the instrument makes national impact as it forms the basis of aberration corrected TEM capability into the future. Thank you to the ARC for investing in the platform through the LIEF scheme. Also to the state govt of SA for the support provided. This platform is part of a facility that makes a significant impact here in SA in research and industry. Thank you to the Univeristy of Adelaide for its significant coinvestment not only in the the instrument but the building and environment. The contribution of the partner CiS and their institutions is also critical. I am delighted it forms an integral part of the AMMRF and I look forward to hearing about the research outcomes it produces in the future.